PM Harris in Molineux. Clockwise are Cuthbert Sharry of Molineux (hand on board), Olson Johnson of Small Corner, Stephen Sharry of Molineux, and Walford Stevens of Small Corner. 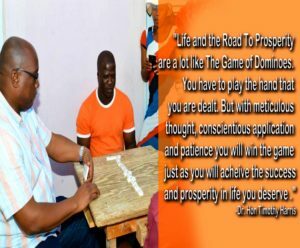 BASSETERRE, ST. KITTS, October 7, 2017 (PLP PR Media Inc.) — Sponsor of Constituency Number Seven Domino League and Area Parliamentary Representative, Dr the Hon Timothy Harris, is saying the league has realised its original goal of uniting communities and has even spread its appeal across political boundaries. According to the sponsor, the league is into its twenty-second year and this year it has the largest number of participating teams. Fourteen teams are taking part in the competition which started on August 10. Twelve of the teams are from Constituency Number Seven, while two are from the neighbouring Constituency Number Six. Dr Harris, the Political Leader of the Peoples Labour Party (PLP) one of the three parties in the ruling Team Unity Administration, made the remarks on Thursday evening October 5 after watching two of the games in the on-going league. He first visited the Edgar Gilbert Sporting Complex pavilion where Molineux was facing Small Corner Bar. PM Harris in Saddlers. Clockwise are Sylvester Phipps of Saddlers, Valencia Alexander of Beers, Cleon Walters of Saddlers, and William Alcender of Beers. 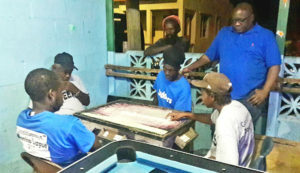 The Prime Minister’s second stop was at the Shanty Bar in Saddlers, in Constituency Number Six, where the home team Saddlers was facing the visiting Beers from Lodge Village in Constituency Number Seven. Only two games were played on Thursday evening and as a result he was there until after 10:30 pm when the game ended with the home team claiming a 13-8 victory. Interestingly Small Corner who have been using the Edgar Gilbert Sporting Complex pavilion in Molineux as their temporary home following the destruction by Hurricane Irma of the shed they were using on Lemon Hill as their home base, also beat Molineux 13-8. Both teams are from Constituency Number Seven. According to Dr Harris, the aim of starting the league was to get rid of some of the divisions where persons from one community would not go to another community because of infighting. The organisers of the domino league hoped that those things would basically disappear in time.